A locust borer beetle, Megacyllene robiniae. 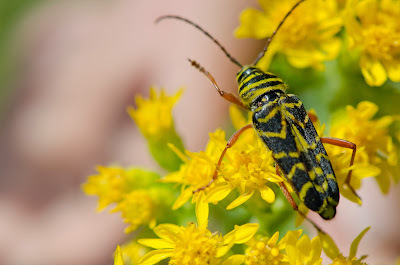 Locust borer beetles can be found on goldenrod flowers now. You might take one for a black and yellow wasp if you look too quickly. Closer inspection will reveal their exceptionally long antennae; locust borer beetles are members of the family cerambycidae that are called"long-horned" beetles because of them. They spend their larval stages on black locust trees. When they are not busy eating goldenrod pollen, the autumn adults can be found on locusts tree trunks, mating or looking for good places to lay eggs. The larvae hatch before winter and spend the cold months under the bark. When the weather warms, they'll burrow into the trunk and pupate. They emerge as adults in late summer and early fall and begin the cycle again. The adult eats goldenrod pollen. Note that the third yellow stripe on its back is shaped like a W.
One of the prettiest insects ever! Great photos! I had the locust beetle visit my blog a couple weeks back when we took a virtual field trip to the goldenrod garden.